Russia can avoid implementing European court judgments if they conflict with the Russian constitution, a top Russian court has ruled. Russia is legally bound by the European Convention on Human Rights. But the Russian constitutional court says Russia "can step back from its obligations" if that is the only way to avoid violating its constitution. 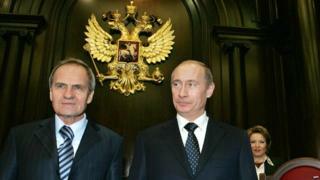 Russia objects to a European Court of Human Rights demand that it compensate shareholders in former oil giant Yukos. The Council of Europe (CoE), which monitors compliance with the convention and ECHR rulings, voiced concern about the Russian decision. CoE Secretary General Thorbjorn Jagland said Russia acknowledged that ECHR rulings were "binding". "However, the stipulation in today's decision that there may be exceptions to this rule raises several question and concerns. My experts are analysing the decision and I will be taking it up with the highest Russian authorities," he said in a statement to the BBC. The Russian court ruling on Tuesday said ECHR judgments did "not override the pre-eminence of the constitution in the Russian legal system". An ECHR ruling in July 2014 told Russia to pay the Yukos shareholders €1.9bn (£1.3bn; $2bn) in compensation. The ECHR found Russia in breach of the convention's Protocol One, Article One, which covers protection of private property.